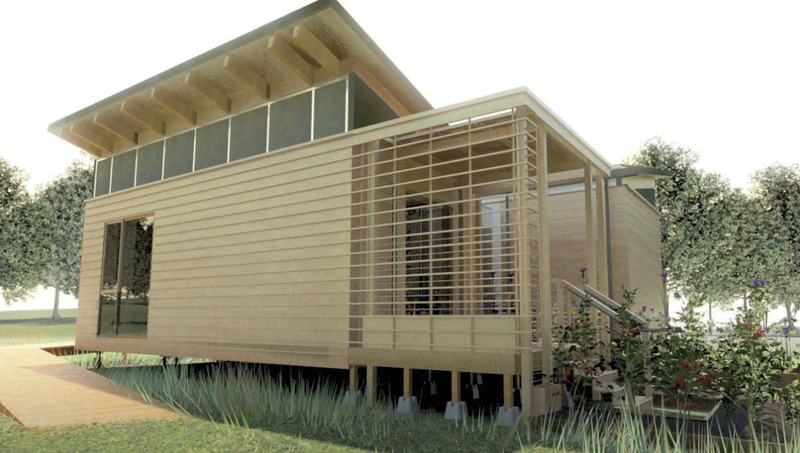 Solar Decathlon homes typically focus on the obvious – using energy from the sun. Students of the University of Maryland chose instead to highlight another precious resource often taken for granted: water. Their design, titled WaterShed, was inspired by the Chesapeake Bay watershed, the largest estuary in the United States with an area of 64,000 square miles spanning the states of Maryland, Delaware, New York, Pennsylvania, Virginia, and West Virginia. Suburban sprawl combined with the lack of stormwater management has threatened these natural ecosystems. WaterShed offers a sustainable model for living in the area, incorporating a range of water features and living elements. 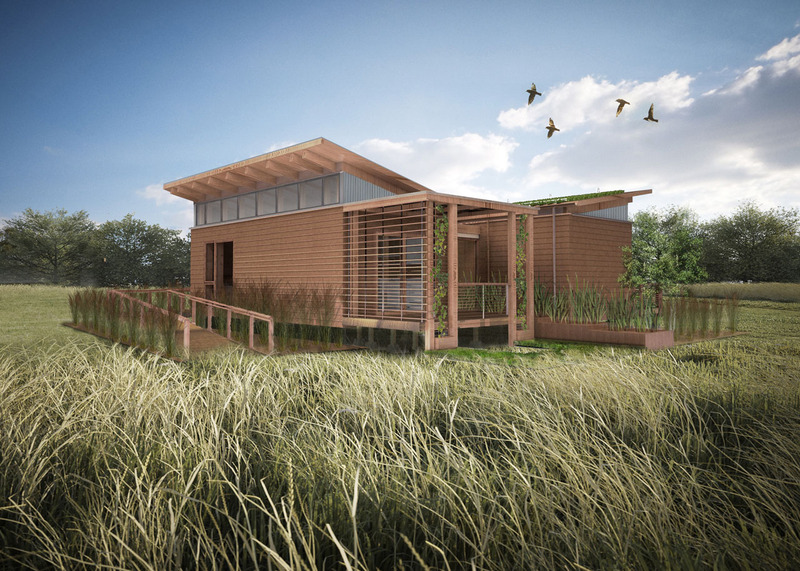 Leah Davies, who serves as one of the team leaders, explains that the home "mimics the cyclical nature of the Chesapeake Bay ecosystem by demonstrating the hydrologic cycle on a micro-scale." 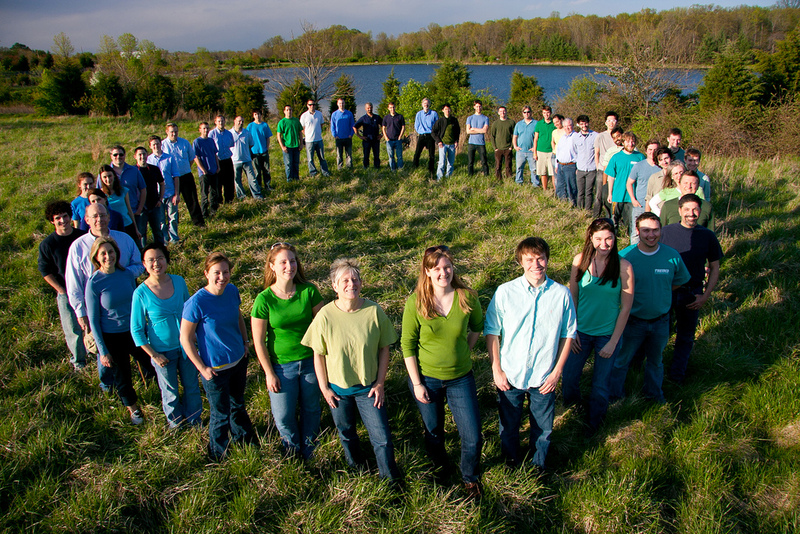 The 2011 University of Maryland Solar Decathlon team is comprised of nearly 300 students from a variety of disciplines, including architecture, engineering, environmental science and technology, plant sciences, landscape architecture, and computer science. They are the fourth team from the school to compete, and they hope to follow in the footsteps of the 2007 team, whose LEAFHouse design placed first among U.S. teams and second place overall, winning the coveted People's Choice Award. 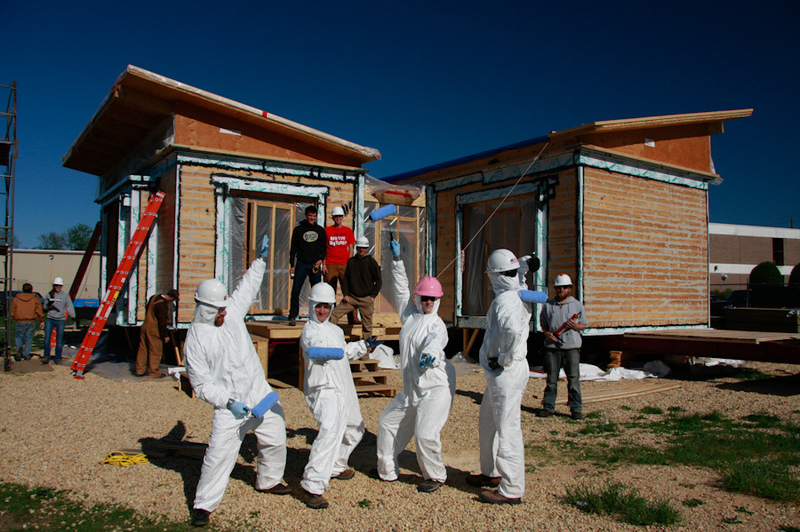 In fact, Davies chose to pursue her Master of Architecture degree at the school because of its history in participating in the Solar Decathlon. Building on concepts explored in LEAFHouse, the design of WaterShed emphasizes connections among occupants, landscape, and the built environment. 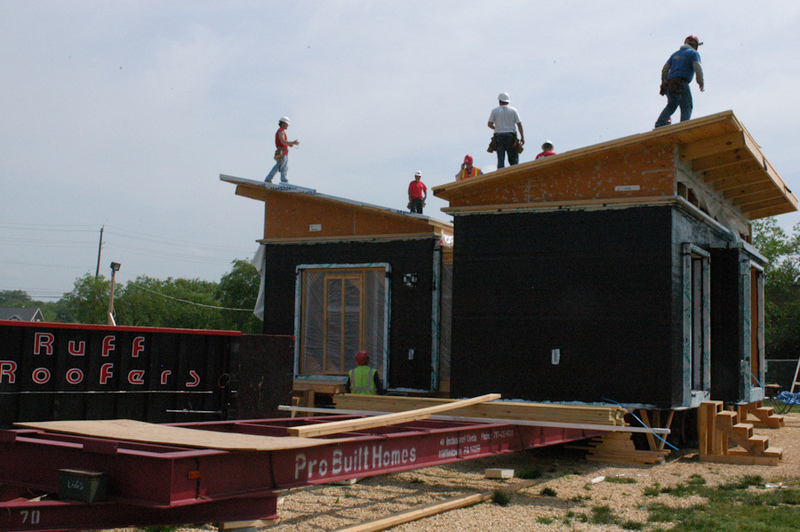 The program is dispersed between two rectangular modules, which can be loaded separately on trucks for shipment. These units are capped with a split butterfly roof; one side is outfitted with photovoltaic panels, and the other serves as a green roof to minimize the heat island effect and direct water into a catchment basin. 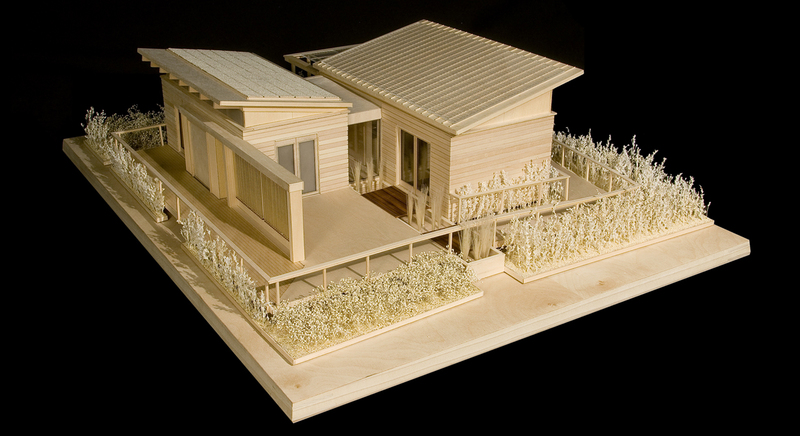 The two units are connected by a bathroom, which, along with constructed wetlands featuring native grasses that filter stormwater and graywater for reuse, forms a central "water axis" through the home. WaterShed's exterior will be clad in poplar siding that has been thermo-treated, which creates a heat-treated lumber product that is more eco-friendly than chemically treated alternatives. The home's interior will feature a clean material palette of drywall and dark-stained composite wood floors made of thin strips of recycled wood, to be oriented in the same direction as the central water axis. A clerestory constructed of a translucent wall panel system by Major Industries wraps the house and admits natural light, along with operable glazing on the north and south facades, which also promotes cross ventilation. 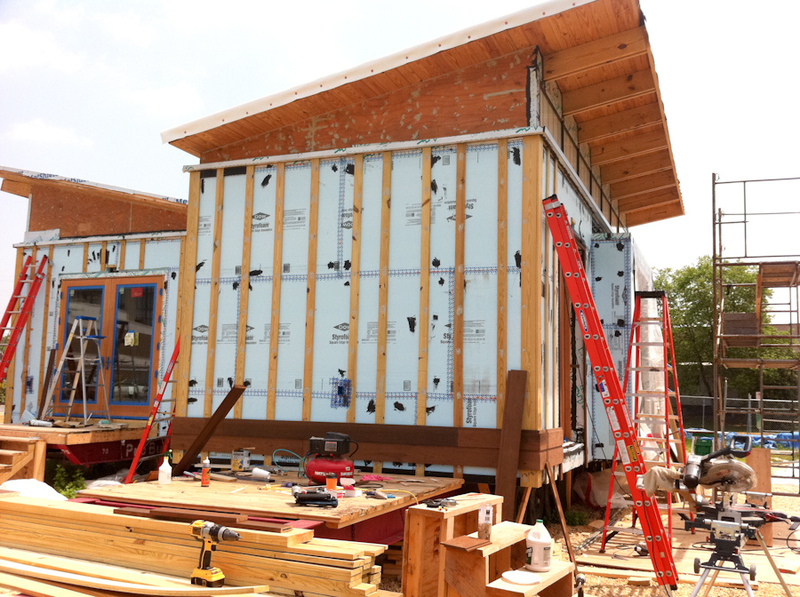 Although many Solar Decathlon homes feature open floor plans in the interest of flexibility, Davies believes that "in a really livable house, it's nice to have separate spaces." WaterShed is organized into defined public and private areas. The north module accommodates the kitchen, living room, and attached decks, and the south module functions as a bedroom, which can be converted into an office. Occupants move between the two units via a small hallway along the bathroom, and a large barn door can be closed for privacy. This layout also allows for a "wet core" that runs crossways to the central water axis, efficiently consolidating plumbing for the kitchen and bath as well as creating a central mechanical core for ductwork. Other living elements and water features throughout the design include a composting area off the kitchen, which is covered by a pergola that forms a vertical green wall along the deck. Below the deck is a U-shaped garden for growing vegetables. A liquid desiccant waterfall doubles as an indoor water feature and provides high-efficiency humidity control. It will be situated on either side of the bathroom hallway, and students designed a Plexiglass detail to reveal the "waterfalls." By using water as a design element, students hope to remind the home's occupants to conserve it. As Davies sums up, "People have begun to fine-tune the issue of solar power, so we wanted to look at something beyond that -- water consumption -- and educate people on how to use less water in the house."